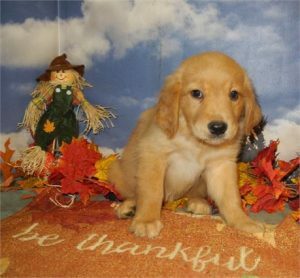 The Golden Retriever is a large-sized breed of dog bred as gun dogs to retrieve shot waterfowl, such as ducks and upland game birds, during hunting and shooting parties, and were named ‘retriever’ because of their ability to retrieve shot game undamaged (soft mouth). Golden retrievers have an instinctive love of water, and are easy to train to basic or advanced obedience standards. They are a long-coated breed, with a dense inner coat that provides them with adequate warmth in the outdoors, and an outer coat that lies flat against their bodies and repels water. Golden retrievers are well suited to residency in suburban or country environments. They shed copiously, particularly at the change of seasons, and require fairly regular grooming. The Golden Retriever was originally bred in Scotland in the mid-19th century. The breed is a prominent participant in conformation shows for purebred dogs. The Golden Retriever is popular as a disability assistance dog, such as being a guide dog for the blind and a hearing dog for the deaf. In addition, they are trained to be a hunting dog, a detection dog, and a search and rescue participant. The breed’s friendly, gentle temperament means it is unsuited to being a professional guard dog, but its temperament has also made it the third-most popular family dog breed (by registration) in the United States, the fifth-most popular in Brazil and Australia, and the eighth-most popular in the United Kingdom. Golden Retrievers are rarely choosy eaters, but require ample (two or more hours a day) exercise. The breed is fond of play but also highly trainable.